Wind Power uses this product for solid structural repairs on epoxy boards. 3oz. 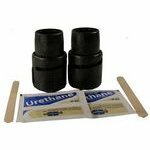 epoxy resin, hardener, fiberglass cloth, 2 grade sanding sponge, mixing sticks & cup, cover sheets & instructions.